Make way for a new family favorite, and with the extra flavor kick of HOFFY bacon, you won’t want it just for the holidays. Bring a large pot of salted water to a boil. Cook the green beans until crisp-tender, then drain and shock in ice water to stop the cooking process. Dry the green beans on paper towels and reserve. Heat a large skillet over medium heat. Add the Hoffy bacon and cook, stirring occasionally, until crisp and golden brown, about 10 minutes. Transfer the bacon to a paper towel-lined plate. In the same skillet, add the shallot and sliced mushrooms to the bacon fat and sauté over medium-high heat, stirring occasionally and scraping up any brown bits on the bottom of pan, until tender and golden brown, about 5 minutes. Add the flour to the vegetable mixture and cook for 1 minute, stirring constantly. Slowly stir in the milk and continue stirring until the mixture thickens, about 5 minutes. Season with Dijon, Worcestershire, salt and pepper. 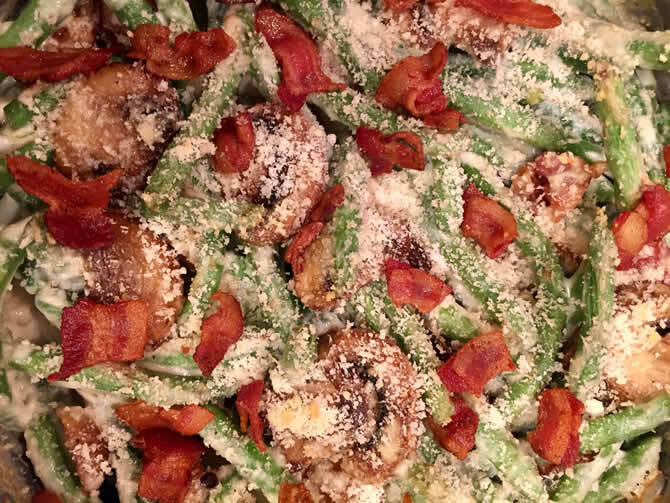 Stir in the steamed green beans and half of the cooked bacon. Transfer the mixture to a 2 1/2-quart casserole dish. Combine the Panko crumbs and Parmesan cheese in a mixing bowl. Sprinkle the mixture over the top of the casserole and finish by topping with the remaining bacon. Bake until mixture is bubbly and heated through, about 15 minutes.